Good Things Come To Those Who Wait In Line NPR's Scott Simon considers the joys of standing in line, whether for a flight home for the holidays or a tub of popcorn at the multiplex. 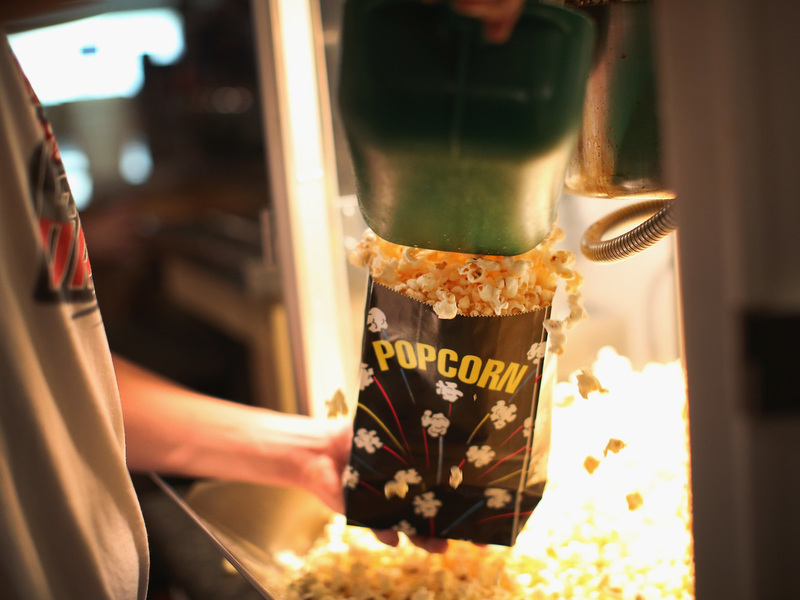 Dillon Smith gets popcorn for customers in the concession stand at the TK/Starlite Drive-In Theater in Nebraska. We're used to seeing ourselves ranked by our worth during these days of holiday travel. We stand in lines behind signs that designate not just first class and coach, but five or six boarding groups, grading us by what we've paid to fly and whatever extra bounty we've offered to sit in an aisle seat. Or scrunch close enough to first class to get a whiff of the fig bars and smoked almonds. Or to clamber onto the aircraft five minutes before the next group and hope to squish a case into a shrinking space before fellow passengers get a chance. Sometimes I think I hear Group 2s mutter, "Look at Group 4. Poor dears, I can hear their stomachs growl from over here. Glad we're not seated next to them." But we were surprised to see lines of a similar kind when we went to a holiday movie the other night. The country's largest movie chain has a loyalty program, which, alas, sounds a little like something left over from the old East Germany. It lets you avoid the long general entrance line and just pass your smartphone over a reader to proceed to your preselected seats. We stood in the general admittance line long enough to see our fingernails grow, then languished in another line at the concession stand. We saw the mountain of popcorn dwindle, bucket by bucket. We heard the nozzles on soft drink machines fizzle out, flavor by flavor. Our children looked anxious as our line stood as still as a column of wooden soldiers. Then we heard laughter and frivolity. People who had just come in from the street flashed their phones and frolicked past us, like spring lambs, to the front of the popcorn line. When we asked, "Uh, how do those folks get to go in front?" a red-vested staffer answered, "Oh, those are our exclusive premier service members! Just $15 to join." I've grown to accept that people should pay more for more space on an airplane; and then more to board earlier, or sit closer to the front or on the aisle; and the scores of other ways businesses seem to make money off of their own delays and shortages by offering people a chance to jump the line, for a price. But the popcorn line at the theater to see a holiday family movie may be one of the few occasions we still have to look around and see all kinds of people from all kinds of backgrounds, excited for the same happy purpose. Sometimes the best show is before you even enter the theater.